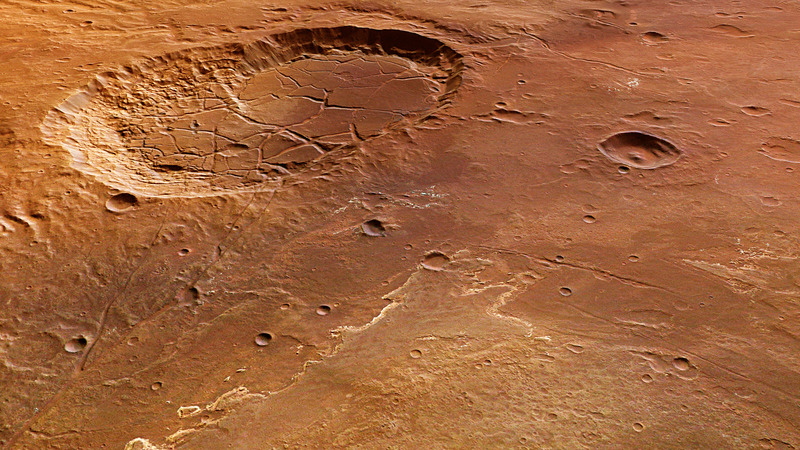 On 27 April 2012, the High Resolution Stereo Camera (HRSC) operated by the German Aerospace Center (Deutsches Zentrum für Luft und- Raumfahrt; DLR) on board ESA’s Mars Express spacecraft acquired images of part of Ladon Valles. These images show an area north of the Holden and Eberswalde craters in Mars’ southern highlands. The overview map clearly shows that, at one time, substantial quantities of water flowed in a southerly direction, both along Ladon Valles and directly from the southern highlands, into an immense and ancient impact basin. A double crater lies on the northwestern edge of this old basin, a feature also easily identifiable in these images. Small watercourses that lead into the large impact crater can be seen to the west and above these two partially overlapping craters. To the east and below the Sigli and Shambe craters lies the mouth of Ladon Valles. Light-coloured sediments can be observed here and at isolated points further north. On closer scrutiny, light-coloured and striated sedimentary layers become visible. Studies indicate that these sediments are partly made up of clay minerals, formed through the influence of water. The presence of these minerals make it possible to conclude that liquid water was present in this area of the Martian surface for a relatively long period of time, most likely in the form of rather large enclosed bodies of water, such as a lake or a small landlocked sea. 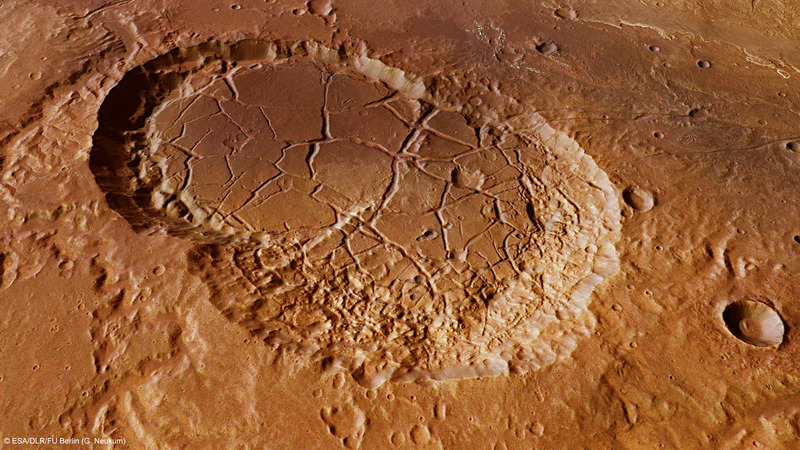 Extensive arc-shaped fracture structures along with smaller impact craters can be identified in the middle and right-hand area of this image. This most probably arose due to additional weight and the associated ’compaction’ (compressive action) of large masses of sediment that built up in the impact basin, causing stresses in the crust. 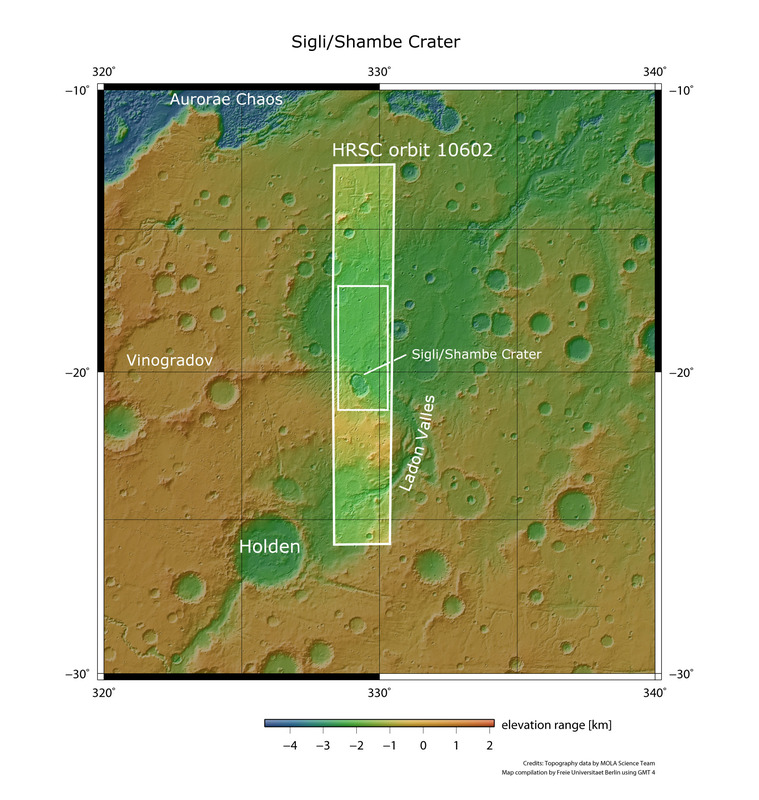 The interconnected craters of Sigli (to the south) and Shambe (to the north) were probably formed almost simultaneously by a double impact. This double crater is also partially filled with sediments. In contrast to the larger impact crater, this feature has many fracture areas that were probably not caused by tectonic stresses in the Martian crust. Instead, this pattern is more reminiscent of desiccation cracking, albeit on a large scale, and may therefore be the outcome of what were once wet sediment layers drying out over an extended period of time. This caused their volume to decrease and, in turn, gave rise to expansion cracks. These images were acquired with the HRSC system during Mars Express orbit 10602. The image resolution is approximately 20 metres per pixel. These images show a section at 18 degrees south and 329 degrees east. 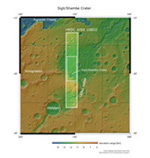 The plan-view colour image was created using data from the nadir channel, the field of view of which is aligned perpendicular to the surface of Mars, and the colour channels; the oblique perspective views were generated from HRSC stereo channel data. The anaglyph, which creates a three-dimensional impression of the landscape when viewed with red/blue or red/green glasses, was derived from the nadir channel and one stereo channel. The black-and-white image is based on data acquired by the nadir channel, which has the highest resolution of all the channels. The colour-coded plan view is based on a digital terrain model of the region, from which the topography of the landscape was derived. The HRSC camera experiment on board the European Space Agency’s Mars Express mission is headed by Principal Investigator (PI) Professor Gerhard Neukum (Freie Universität Berlin), who was also responsible for the technical design of the camera. The science team consists of 40 co-investigators from 33 institutions in 10 nations. The camera was developed at DLR under the leadership of the PI and it was built in cooperation with industrial partners EADS Astrium, Lewicki Microelectronic GmbH and Jena-Optronik GmbH. The instrument is operated by the DLR Institute of Planetary Research in Berlin-Adlershof. The systematic processing of the HRSC image data is carried out at DLR. The images shown here were created by the Institute of Geological Sciences at Freie Universität Berlin.